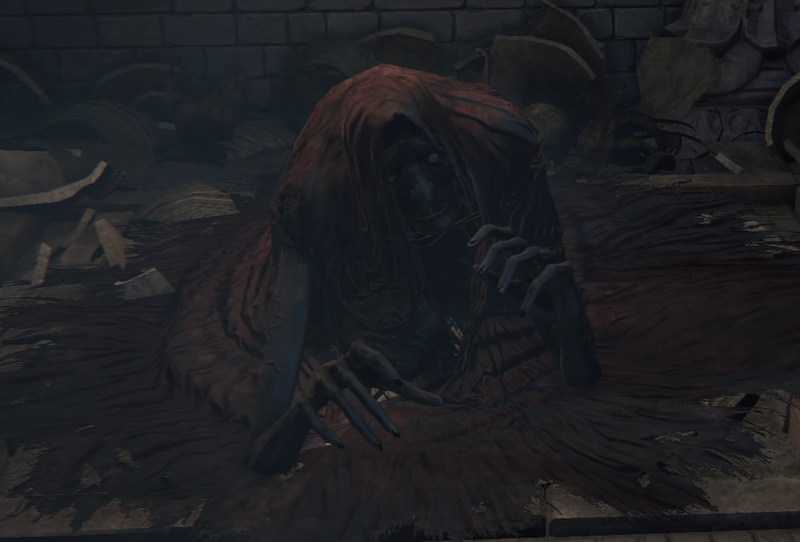 Oedon Chapel Dweller is a friendly NPC that lives in the Cathedral Ward. Upon speaking to him, he tells the Hunter that the incense in the Chapel Ward keeps the beasts away, and he compels the Hunter to advise anybody looking for a safe place to stay the night to come to the Oedon Chapel. Once survivors start arriving, he comments on what he makes of their character, and how willing they are to converse with him. Gives Pebble if you hit him once and talk to him afterward. Drops Formless Oedon Rune if killed. "Ahh, a hunter are ya? Very sorry, the incense must've masked your scent. Good, good. I've been waiting for one of your ilk. These hunts have everyone all locked up inside. Waiting for it to end... It always does, always has, y'know. Since forever. But it won't end very nicely, not this time. Even some folks hiding inside are goin' bad. The screams of wimminfolk, the stench of blood, the snarls of beasts... none of em's too uncommon now. Yharnam's done fer, I tell ya. But if you spot anyone with their wits about 'em... Tell 'em about this here Oedon Chapel. They'll be safe here. The incense wards off the beasts. Spread the word... tell 'em to come on over. If you wouldn't mind... Hee hee..."
"Ahh, the hunter. Alive and well, are ya? This here's a safe place. Stay as long as you like. But... next time you're out on a hunt, remember what I asked. If you find any sane survivors, tell 'em to seek shelter at Oedon Chapel. Cause there's nothing to fear here... ha, hah ha!" "I know I shouldn't be askin' you, but... If you happen upon someone while hunting, tell 'em about this here Oedon Chapel. If they seem worth being told that is... Oh, and I do sincerely hope they are... Hee hee hee hee hee..."
"Ahh, the hunter. Alive and well, at that! Another one you sent made it here safe and sound. This place is a haven now, for so many. Thanks to you. I’m… overjoyed, really. That you’d even give me the time o’ day! I don’t suppose there’s anybody out there worth savin’ anymore. But you did all ya could, and so many owe you so much. Amazing, really. Not ‘cause you’re a hunter, but because you’re you. [nervous laugh] Makes me think, once dawn breaks, maybe I can just, you know, start over. Makes it easier to bear all o’ this, you see? You’ve made life easier. Thank you." "If you please, kind hunter.... When the night of the hunt passes, s'pose, we could be friends, maybe? Now, I know I hardly deserve it, but... Well, I had to just, ask, you know? 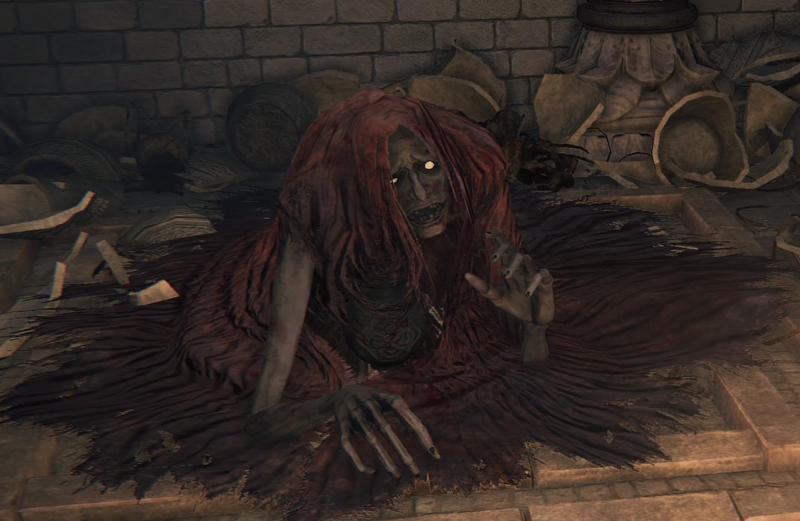 [nervous laugh] Out of line, yes, perhaps so, but, well... Give it a thought, if you wouldn't mind, o' course..."
"There ain't no survivors, Yharnam's done for." "Aww! Please, no more! It's my fault, I know. So, help me, please. Please, calm it down." "I just wanted to help... I..."
"I.... only wanted... to be... your friend..."
Despite his suspicious appearance, he has nothing but good intentions. He is extremely distraught whenever any of the survivors die and even asks to be friends with you after you bring in all possible survivors (the Suspicious Beggar does not need to be present to initiate this response). If killed, presumably with nothing left to lose nor any reason to lie, his dying words are that he just wanted to help people. He will cover his face and refuse to speak with you if you murder the npcs taking refuge in the chapel. 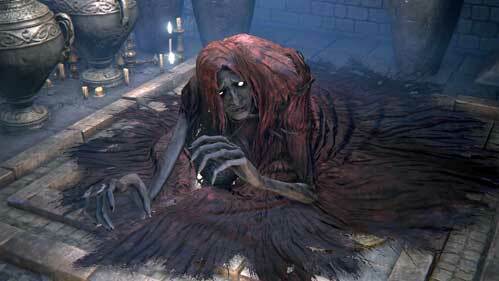 In the German, Spanish and French versions of the game the Oedon Chapel Dweller is synchronized by a male voice actor. The Skeptical Man mentions him as a male. Additionally, clipping through his game model reveals no breasts. The Suspicious Beggar gives you 3 pellets after killing him, same as the other male. He only gives 2 pellets for each of the females. I got mad due to fighting Eileen and losing multiple times so I threw an in game tantrum and killed every single npc, hostile or not, that I could. I kinda feel quilty now. *****, i didn&apos;t send any npc to the chappel as i was too worried with the story, do you guys know when i won&apos;t be able to send him any more survivors? He actually says "There ain&apos;t no more survivors, there can&apos;t be... Yharnam&apos;s done for..."
lol guys I don&apos;t trust this guy one bit, in fact I never trust any character outside of the nexus (hunters dream etc.) or safe area of any Dark Soul games. Because why don&apos;t trust this guy if you send the ally way woman there (the person who gives you the &apos;respect&apos; gesture) was gone and there was a puddle of blood and a trail leading to him. SUSPICIOUS DONCHYA THINK? Well she could&apos;ve died and then he ate her but still that&apos;s wrong too, he doesn&apos;t tell you anything but laugh. Is a Mother*****er! You&apos;ll have to save every npc (except the beast guy) in order to get all his dialouge. I accidentaly sent the skepticak ***** to iosefkas clinic and now this guy just keeps repeating the same god ***** dialouge! I&apos;ve killed all bosses except moon presence yet he won&apos;t stop repeating himself. ***** this! Chapel dweller, prepare to taste the cold steel of my blade!! The first time i went into the cathedral i thought he was a monster and killed him. i saved a old lady in yharman but when i came back the old lady have disapear who killed her? it was the dweller? If the granny is sent to the chapel and talked to enough times, she will start leaving to find sedatives, eventually she doesn&apos;t come back. When this happens the dweller comments on whether or not she was killed by a beast, or if someone came in and killed her. the skeptical man is skeptical, right? So everything he says, the oppersite is true. Therefore the dweller is male, right guys? So, for a while I let the thing be. It was nice to me....Well it kept asking to bring back survivors and I thought "This lady (I originally thought was a women) wants me to bring people back so she can eat them. I&apos;m not stupid, this thing is trying to trick me into giving it food. People food". So I killed him. Got a trophy and an item....Then I read this to double check if I dun goofed or not. Apparently, I did. I&apos;m not gonna read any other Npc stuff, because I like taking this stuff as it comes. I just had to know if the creature was innocent or not...now I feel *****ty. Thank gosh, it&apos;s a video-game. I wasn&apos;t sure I trusted it so I smacked him once with my sword, then talked to him again not expecting it to even change anything, since this is not mads effect or something, and he said ahhh no more and gave me a pebble and maybe something else? I get the feeling FromSoft made him to test the morality of its players, and troll them. It says a lot about someone when their first instinct is to attack or talk to something that looks different, videogame or not.